2020 Vision Quest | How the heck do we get up Mt Washington?? Mt. Washington is a daunting hike for anyone, with sight or without. When Randy asked me to lead him and a close group of friends up the mountain, I can honestly say that my first reaction was “Sweet!” And then about two seconds later, I thought “ummmm…WHOA.” How the heck were we going to do this? Many sighted people do it as a day trip (I’m talking hiking here, NOT driving up the toll road!). It can take anywhere from 6-12 hours round trip, depending on your fitness level and choice of trails. So when I started thinking that “ummm…whoa,” I knew my biggest challenge was going to be how to give us the best shot at making it. That led me first to securing overnight bunks at Lake of the Clouds AMC hut (a mere 1.4 miles from George’s summit) so that we could split the hike into two days. 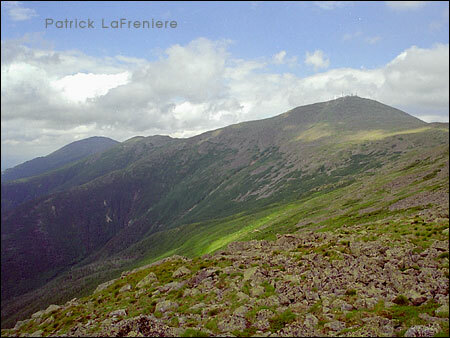 Once the hut was confirmed, I talked to a number of hiking friends who discussed the challenges of Tuckerman’s and the rocky East-sloping trails. A West-side approach was clearly the better option, especially given the hut’s location. A new hiking forum friend, Sabrina, also advised us, based on hiking with her blind mother, to try the Jewell Trail which is easier (although longer) because of the footing. In the end, we’ve chosen to ascend the Ammonoosuc Trail, parts of which can be steep and rocky. But it also has a mild beginning and is the shortest – I’ve seen Randy conquer a few technical rocky ledges and have the confidence he can do it well. Descending on steep and rocky terrain is what we’ll try to avoid – therefore, we will either descend via the Jewell Trail or via the Crawford/Edmands Paths. This decision will remain last minute (not just to annoy you all!) but because it will depend on whether we summit Washington the first day or the second. I don’t presume to predict the outcome, given the crazy weather conditions on Washington, but we clearly are hoping to summit on Day 1, so we can celebrate at the hut that evening of the 4th! « A note from Randy – Welcome to the adventure! Those are good trail choices. Tuck’s would be tough. Ammonoosuc is a good choice for ascebt – watch the wet sections! I have done Jewell, Lion’s Head and Crawford as well Crawford is pretty long and rocky in sections. Jewell is long but a good hike and you’ll end up back at the base near Marshfield where you started. Really anxius to watch the posts. My wife and i will be hiking mt washington for the 1st time this summer . plan on taking jewell trail up. ive noticed most take ammonussuc up and jewell down. Any reasoning behind that? Interesting that ou found this blog post! Ammo is a beautiful trail but shorter and steeper so there’s some work involved. I think folks like the notion of the loop and the gentler descent after you are already tired from the work up. By virtue of the shorter mileage it also let’s you evaluate the weather changes and be best prepared for the summit weather evaluation and push. Hope you have a terrific experience. I’ve had some incredible moments up on those trails!